On November 12, 2018, F. Morat México received the honor of “Notified Supplier Of The Year” at the “Regional Supplier Awards North America” ceremony. 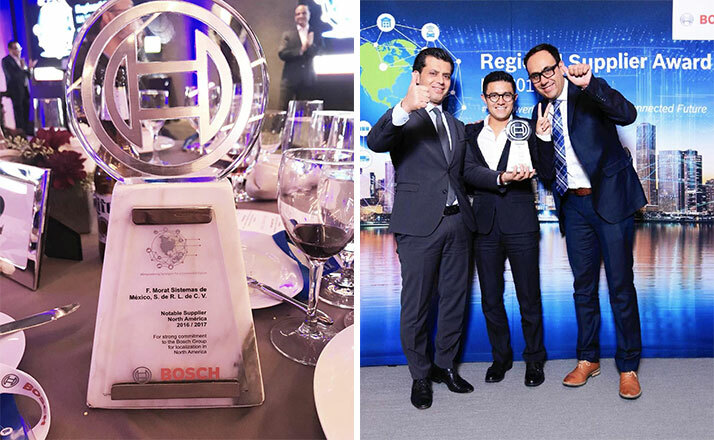 By giving this award, Bosch – the largest automotive supplier in the world—honors the performance of its best new suppliers every other year. Quality, delivery performance, adherence to schedules and consistently positive cooperation as partners ranked among the most important criteria for the decision in favor of F. Morat México. In 1983, F. Morat in Eisenbach produced its first components for the global player Bosch. Ever since, our business relationship has continued to develop. As part of internationalization efforts, the F. Morat México production facility was set up in Lerma in 2015. Thanks to the proximity of the facility to our customers, the effort in logistics was reduced and the relationship with our partners was strengthened. Production started in Lerma back in early 2017 and series production has been initiated for countless projects. These projects include a wide variety of high-precision injection molding components that meet the most stringent automotive quality standards.